An incident at a Beijing shopping mall in which three women snatched a baby from his stroller was not an attempted abduction but a case of mistaken identify, according to a case review by the capital's Public Security Bureau. The authority launched a probe after the child's father complained online about the way the case had been handled by police in Fengtai district. The findings were released on Saturday. According to social media posts by the baby's father, his wife was confronted in a shopping mall on Tuesday by three women who snatched their 11-month-old son from his stroller. He said the incident should have been filed as attempted child abduction. However, on Saturday, the bureau said an investigation had shown the women were acting on behalf of a fourth woman, identified as Li, 62, who had mistakenly believed the boy was her grandchild. Li, who lives in Shandong province, had travelled to Beijing with her three friends in the hope of seeing her grandson, the review said. Due to a family dispute, she had not seen him since his birth in July last year. In June, her daughter-in-law filed for divorce, but the request was denied by a court in Shandong. Li "missed her grandson so much", the review said. Around 10 am on Tuesday, Li saw a woman who looked like her daughter-in-law pushing a stroller and leaving a community in Fengtai. Li took chase but fell down, so she asked her friends to follow the mother. The three friends－surnamed Sha, Gao and Yun－caught up with the mother at the shopping mall in the Dahongmen area and took the baby by force. A store employee intervened after hearing a fracas and returned the baby to the mother, who later called the police. Li arrived at the mall later and, together with her friends, was taken to a police station for questioning. After comparing photographs, officers discovered that Li's daughter-in-law bore a physical resemblance to the mother, and they also lived in the same community. "Li mistook the woman, who was far away at that time, and her friends had never met Li's daughter-in-law," it said. 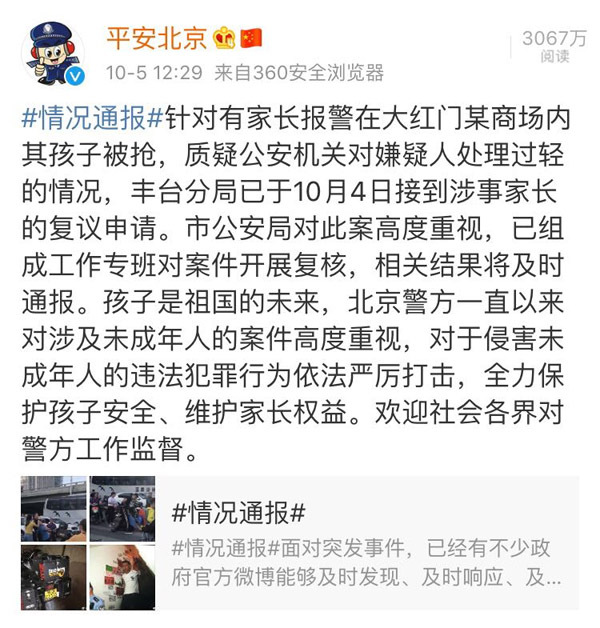 Therefore, the authority added, Fengtai police did not file the incident as a criminal case and instead gave the four women five days in administrative detention－an extrajudicial punishment used for minor or noncriminal offences－for disturbing public order. In his posts, the baby's father had complained that the punishment was too light. Zhao Li, a Beijing criminal lawyer, said he felt the punishment was reasonable. "If the baby's parents are still unhappy, they can ask for compensation by filing a civil or administrative lawsuit," he said.